We've been asked by the Linkchain team to review and audit their smart contracts. We at QuillAudits are a team of blockchain developers , consultants and security auditors , trying to build a more secure and safe community in the Blockchain space. 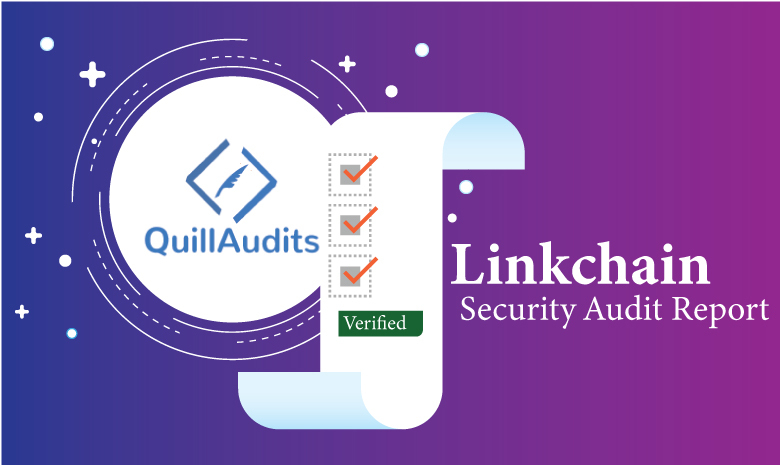 QuillAudits, QuillHash Smart Contracts Security Audit platform ensures the reliability of your smart contract by complete assessment of your system's architecture and your smart contract codebase. This Audit Report highlights the overall security of LinkChain Smart Contracts. With this report, we have tried to ensure the reliability of their smart contract by complete assessment of their smart contract codebase. Quillhash team has performed thorough testing of the project starting with analysing the code design patterns in which we reviewed the smart contract architecture to ensure it is structured and safe use of third party smart contracts and libraries. Deploying the code on testnet using multiple clients to run live tests. Analysing failure preparations to check how the Smart Contract performs in case of bugs and vulnerabilities. No bounty function is present , but tokens for the same is reserved from ico token i.e BOUNTY_TOKENS = 2000000(declared,unused variable) wastage of tokens. You have defined hardcap and softcap in terms of dollars in description and you are taking hard cap and softcap in ether in smart contracts.There must be some ether to dollar conversion mechanism by using oraclize or some manual updation using any function. You are not multiplying totalSupply and other token pool with 10¹⁸ .As all wallets use last 18 digits as decimals for tokens .You must multiply totalSupply and other tokenPool like . Minimum investment price is in terms of USD as provided in description, but in contract it is in terms of ether. SafeMath library is not used in every mathematical function. 2. You are using setHardCap() and setSoftCap() functions to change the hardcap and softcap after contract deployment which is not a good thing as you are claiming refund to investors if softcap is not reached. 3. “Stage can only increment one by one and has to be changed by owner.” This statement is contradicted with the smart contract, you should check current stage and then increment by one or use conditional statements. 1. Declaration of a variables and function name is not standardised at all. It is very important to use standard style define by solidity style-guide . 2. There is no reserve account as you mention in your deployment steps while deploying constructor of crowdsale also start time end time parameters not present. 3. Function addAddressToWhitelist must have check the current stage of a sale before whitelisting the user as stages can only be forwarded and can’t be reverse, so there is no point to whitelist address who want to participate in already ended sale. 4. Solidity version must be fixed. 5. According to standards ,only tokens for sale should be the parts of tokenSale contract and rest of the functionality should be handled in token contract only. 7. Variable and function names should be meaningFul.Some of the variable names are totally meaningless. For ex: idtotokens does not make any sense.It should be like StageToTokens.If you are calculating number of tokens in every stage of sale. Constructor of crowdsale must check the argument with require statement, as it will be wastage of gas if wrong arguments is passed. There is no conversion of ether to usd, as you mentioned conversion is dynamic. Contract structure should be nice enough so that community can easily understand it. Code should be properly commented. These contracts are very unsafe to be used in production.You should review the suggested changes and implement them in smart contract. Thanks for reading. Also do check out our earlier blog posts. QuillAudits is a secure smart contract audits platform designed by QuillHash Technologies. It is a fully automated platform to verify smart contracts to check for security vulnerabilities through it's superior manual review and automated tools. We conduct both smart contract audits and penetration tests to find potential security vulnerabilities which might harm the platform's integrity.